I felt last year that the Tribeca Film Festival was really starting to come into its own. The small sampling of the 2009 selection I have thus far encountered has impressed me even more with its consistency and diversity. Yet two of the most effecting films I’ve found this year are the type of off the beaten track of New York City stories that the festival has supported, with mixed results, since its inception. Gloria La Morte and Paola Mendoza’s Entre Nos stars Mendoza as Mariana, a Colombian woman who struggles to keep herself and her two children housed, clothed and fed after her husband abruptly leaves the family shortly after they join him in New York. Having recently immigrated to the States, she speaks little English and has few exploitable skills, save making some tasty empanadas. After they lose their apartment, Mariana desperately seeks out a network of individuals, including an older Colombian woman who owns a food truck, a black homeless man who teaches her to make money on the city’s recycling program, and a single mother who cuts the young family a deal on a new place to live. Largely based on the immigration story of Mendoza’s mother, the film is shot in fairly standard American indie style, on locations with mostly non-actors in Jackson Heights, Queens. The performances of Mendoza and the children, Sebastian Villada Lopez and Laura Montana Cortez, are what give this sneakily powerful film its weight. The ease with which Mariana, from all signs a Catholic, chooses to have an abortion late in the film is suspect. It also grows increasingly sentimental as it wears on, which might put off some, but I never felt unduly manipulated, even if I bemoaned some of the narrative gaps that help smooth out this appealing families’ rocky ride to the American dream. Joshua Zeman and Barbara Brancaccio’s Cropsey is an absorbing and terrifying piece of filmmaking. Part personal history remembrance, part time capsule of a place, part true crime thriller, it delves into the disappearances of several handicapped children in Staten Island during the ’70s and ’80s. The filmmakers, who are natives of the borough, trace their distinctive childhood memories of the events as well as those of dozens of Staten Island residents who live on with this disturbing mystery, many unconvinced—even though someone has been brought to justice for these crimes—that the book is closed on these terrifying events. 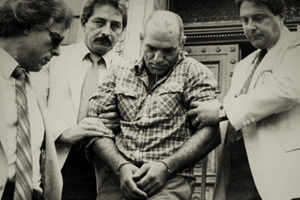 In 1987, a so-called “shadowy drifter” named Andre Rand, an occasionally homeless man and former convicted child abuser who had worked at (and lived in the woods behind) a notoriously inhumane children’s mental institution in the borough, was charged and with the kidnapping and murder of Jennifer Schweiger. A 13-year-old with Down Syndrome who disappeared that year, Schweiger was later found half buried in the woods near the Willowbrook Mental Institution, Rand’s former workplace. Convicted only of the kidnapping, it became apparent over several years that Rand was implicated in the disappearances of a rash of disabled children during the previous decade and a half. Or is he? All the evidence is circumstantial. A few people who the filmmakers encounter doubt that he committed the crimes. Rand refuses to be interviewed and has already been largely demonized by the public at large, mostly due to the deranged photos taken of him as he was led out of a police precinct, drooling, in 1987, when he was first booked. Eventually, as Zeman and Brancaccio attempt to reach out to Rand for answers, he begins writing back to them. The increasingly strange correspondences, which universally maintain his innocence, draw Zeman and Brancaccio even further into the case as he’s brought to trial for another young girl’s 1981 disappearance as his first sentence is drawing to a close.